Recruited from North Ringwood where he only started playing as a 14 year old (he also played at Mooroolbark and Olinda), Matthew Allan was drafted as a zone selection and spent a number of years on the list as the understudy to Justin Madden before finally given his go. 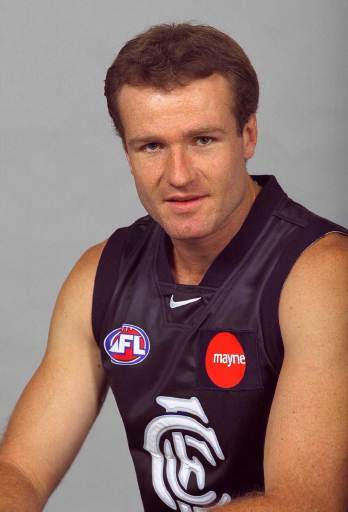 He started playing for Carlton in the last year of the Under 19s in 1991 and wore number 44. He then played in Carlton reserves and in the Eastern Ranges Under 18s where he was a member of the Vic Metro Championships side and was an Under 17 All-Australian. He kicked a goal on debut against the Bears at Optus Oval in Round 15, 1994, and in his early years would be famous for wearing thick thigh pads. When finally given the responsibility of being number 1 ruckmen in 1996 - 7 as Madden began to decline, Allan delivered on his promise. Beginning with more & more games (19 games in 1996), Allan would improve his stats seemingly every year and before too long was a competition leading ruckman, earning his first Top 10 B&F performance in 1997 - his first of 3 in a row. Allan had a massive season in 1999 when he was All Australian, won the club Best and Fairest and played in the Grand Final. He would manage 19 goals, as a ruckman, and break his own impressive average disposals output with 15.6 per game. The Allan - Capuano matchup was a key determinant to the game, and a match-up written about before the game, but Capuano would take the honours on the day whilst North took the flag. The left footed Allan, who would hardly ever use his right, was famous for taking the ruck but - as distinct from the traditional kick behind play - would move forward to steal a goal or two. In some games, Allan despite his size appeared to be all over the field. He became a key player over 1998 - 2000. However, a series of serious foot injuries over 2001 to 2003 reduced Allan from league leading ruckman to a guy who struggled to train. He managed just 8 games in 2001, 4 in 2002 and 6 in 2003. It was a sad sight to see one of our young players struck down. In addition to his injury problems, Allan was deregistered in 2003, given some 'under the table' payments soon after our salary cap breaches. Allan was hauled through the coals, and with his injuries behind him, sought greener pastures away from Carlton. Wearing the number 24 in the Carlton seniors, the 198 cm ruckman had played 140 games for the Blues. Allan was traded to the Bombers for Pick 57 in the 2003 Draft, where he played a further 2 seasons before retiring and playing 21 games and scoring 1 goal with the Bombers where he wore number 27. In 2006 he was the Bendigo Bombers General Manager. Allan wore No.51 (1992) and 45 (1993) when he played with Carlton reserves. At his best Matthew Allan was simply one of the best ‘all round’ ruckman to have represented Carlton and certainly played AFL football in the 90’s. Capable, due to his superior endurance, to play both ends of the ground whilst rucking Allan could also provide a mobile target up forward and convert at a good clip. Injuries however prevented Allan from showcasing his talents long term with his retirement coming much earlier than expected. Should Allan have been given greater opportunities earlier in his career when traffic jammed behind the likes of Harry Madden it would have been interesting to see his development graph and subsequent influence on field. Contributors to this page: Bombasheldon , molsey , true_blue24 , Jarusa , p(12)terg , WillowBlue , timmyd , BlueWorld , keogh , verbs , admin and Juzz . Page last modified on Thursday 30 of May, 2013 20:59:37 AEST by Bombasheldon. 1993 - John Elliott Interview 3 March 93 (page 3 of 4). 1995 Rd 19 - Michael Sexton breaks a tackle.